I had been looking forward to my visit to Whale Tankers for some time. The tankers are festooned with pipes, are colourful and to me, works of art and design. I had to see where a tanker is born, and where do they go to die? Like most vehicles, they usually become part of the enormous scrap metal pool in the sky. I wondered where they have their tyres changed and was amazed to discover that they go to ATS and other such tyre companies as cars do. The Whale Tanker site in Solihull is landscaped with a large lake, home to many birds including geese. I was made very welcome and Dean was allocated to show me around. Alas, being overwhelmed by the visual imagery, I have not remembered all of the processes. 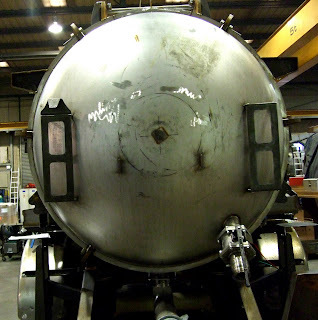 The tank is mounted on a Chassis that is either free issued by the customer to Whale, or bought by them, but in the case of a trailer, it is mounted on to a bogey or running gear manufactured by Whale. T The bespoke castings are designed by Whale and then bought in. Flat sheets of Stainless Steel are laid onto this machine, rolled and the joins automatically welded, creating a round tanker shape. Forming the beginnings of a tanker; the creation of a work of art. You can see where the sheets are welded together, and in the top, shapes which look as if they may be inspection chambers. A tanker showing the strengthening rings. For me, the shapes, marks and geometry are so exciting.